A Luxurious Salon-Quality Experience at Home The finely etched ridges on this permanent file are designed to give you smooth, perfectly manicured nails just like you'd get at the salon. It works so well that you'll never again worry about snagging silk, nylon or any other delicate material. On the go or at home, you deserve professional-quality manicure and pedicure tools. ¥ Slim, sleek, lightweight design goes with you anywhere ¥ Perfect for both natural and artificial nails ¥ Hardened glass won't easily break or wear down ¥ Soft pink handle looks slick with matching protective case ¥ Lasts a lifetime without any wear and tear Gentle, Hygienic and Easy to Clean Forget cheap sandpaper files that wear out with only a little use and metal files that chip or crack your nails. The high-end quality of this crystal-like glass nail file makes it safe and easy to shape, clean and file your nails in a hurry. The Malva Belle nail file is tougher than crystal and completely nonporous, so there's no chance of trapping bacteria and dirt like those cheap files. Plus, it's super easy to clean Ñ just rinse in warm water. You can even disinfect it as often as you like without wearing it down. The Perfect Gift Idea Looking for a gift idea that she'll really love? 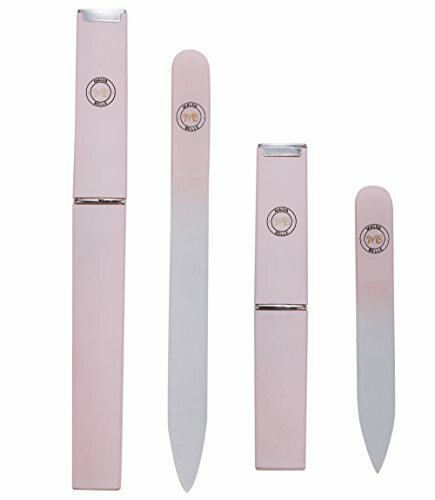 Surprise her with this beautiful, long-lasting glass nail file. Ideal for Mother's Day, birthdays and anniversaries, this file is the perfect gift for any occasion. Order now and pick up one for home, the office, and your glove compartment and a few to give as gifts. THE NAIL SET THAT BRINGS THE SALON TO YOUR HOME - This professional nail file set for women includes two handy sizes of pro-grade crystal files to keep your nails super healthy and in beautiful shape. Forget the cost of expensive treatments; your nails will look like they've been shaped at the salon every time! MADE WITH CRYSTAL GLASS THAT'S BUILT TO LAST - Crafted in crystal glass with finely-ridged edges that never weaken, our professional nail files will literally last you for years. Just run them under the water to keep clean. Goodbye sandpaper-like files that ruin your nails! Comes with a hard case for easy storage. MINI NAIL FILE: PERFECT FOR TRAVEL OR LITTLE ONES - The cute little nail file included in this pro-grade manicure and pedicure kit is ideal for popping in your purse or bag so you can handle any nail emergency on the go. And with its small profile, it is a great little tool for keeping your baby or kid's nails in shape. Professional perfection in miniature! GIVE THE GIFT OF MALVA BELLE - Want to treat a female friend or family member to a bit of salon-style pampering? Then this pretty nail file set is the ideal gift for giving her the feel-good factor! In just a few easy steps she'll have exquisite nails she can show off all over town. Great for women with natural, fake, gel, acrylic, clear, gelish and shellac nails. EXCEPTIONAL QUALITY, IN EVERYTHING WE DO - At Malva Belle, we are extremely proud of the superior quality of our products. Each one of our nail and beauty tools are designed to be highly effective, and we ensure that they are built to last. Our promise to you: Your nail file will be just as effective on the 100th time as it was on the first. If you have any questions about this product by Malva Belle, contact us by completing and submitting the form below. If you are looking for a specif part number, please include it with your message.